This is a favorite of all my reading students. Everyone loves Puppy Party! This freebie will introduce you to one of many board games that is available in my recent publication: Reading Board Games which focuses on for phonics and Orton Gillingham based reading instruction. 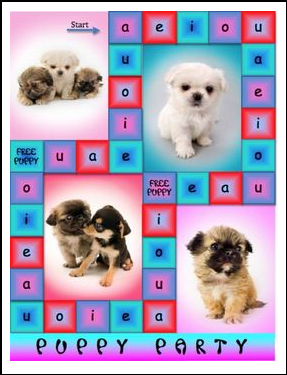 This particular game works on the short vowel sounds. As players practice their short vowel sounds and create words, they will collect puppy cards. The winner is the player with the most puppies!